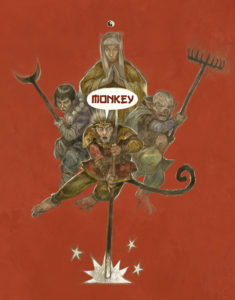 23 Days of Monkey | Monkey Magic! How I know Jon Hodgson, one of the leading lights at Cubicle 7 and more roleplaying/gaming art credits than I can comfortably fit in my head, from his time as the ‘comic specialist’ in the mighty Travelling Man shop ( a glorious den of gaming, comics and general geekry) where he was the cheeky monkey who helped me out when the ‘rpg specialist’ around. Many years later he remembered me and was graceful enough to do the cover for the first edition of the game, which was a huge personal boost for me and the game. Jon has a firm grasp of mythic storytelling, witness his magnificent work on C7’s The One Ring, and his past generosity made it a no brainer to ask him to do the cover art for the 2nd Incarnation. Jon has a fierce schedule of work these days and I’m very happy found a gap and he’s said yes! This is the provisional cover for Monkey the 2nd Incarnation, which is the same as current cover but with the ‘trade dress’ (that’s titles and logos) rearranged. If the campaign funds Jon will be doing a new cover with all four of the pilgrims. This is something I wanted for the first edition, but at the time I didn’t have enough money to afford it. In those days D101 Games ran on pennies. In fact I blew the entire art budget on the front cover! Fortunately after a bit of a search I found enough good public domain art for the interior art. Jon has also done the cover for the Ministry of Thunder Adventure collection which is one of the Stretch Goals for the Kickstarter Campaign. (see Day 12 for more details). As our journey nears its end, time to talk about another of the artists who will be working on the book : Dan Barker. I’ve been a big fan of Dan Barker’s work since I came across him in the classic Tales of the Reaching Moon fanzine for the gaming world of Glorantha in the 90s. 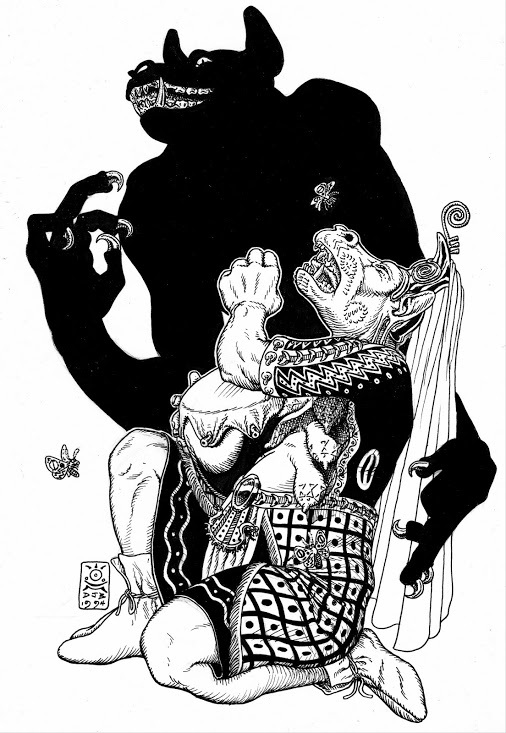 As a rather rabid fan of Glorantha at the time some of my favorite pieces were his full page illustrations which were intended to be cut out and pasted over the piss-poor illustrations in Avalon Hill’s Troll God box set. Dan’s work then and the bits he’s done since show’s he’s got a firm grasp of the mythic storytelling that Monkey requires, as well as the strong technical talent that I want for the new version of Monkey. He’s also got a wicked sense of humour, that comes out in some of his pieces (which as my Grandfather who was a senior art lecturer said is essential for a working artist’s work). This humour is in full evidence I feel in this ‘test’ piece that Dan sent me last year (if you are not getting it look at how Monkey is riding his cloud). Dan is also a big fan of the game. Both he and his partner Gwen regularly run the game at conventions that they attend. Dan has been one of the voices that has been pushing me to get Monkey 2 done and he was the first people to run the new game. So I’m more than happy that Dan is joining the merry band who will be Journeying West to produce the new Monkey the 2nd Incarnation! Day 21 of 23 Days of Monkey, Kickstarter opens on 8th January 2017. 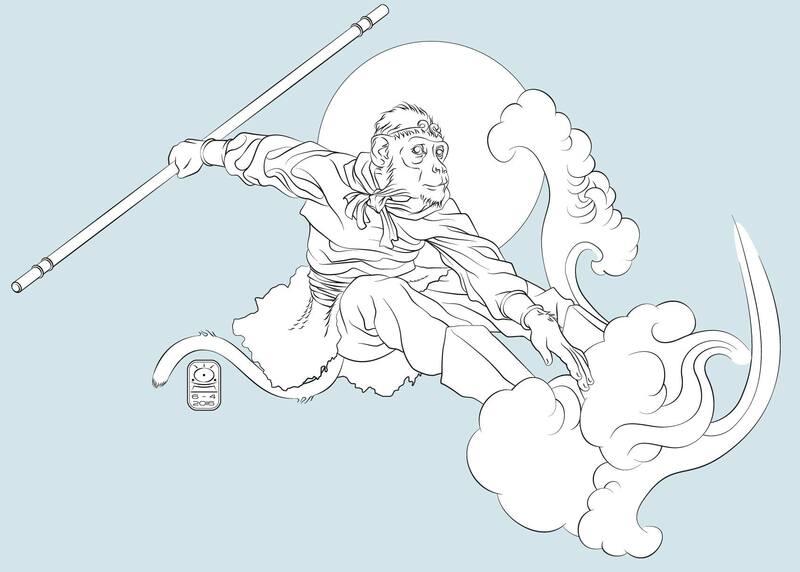 Today we look at how adventures work in Monkey. How Monkey supports the narrator creating them, and how the Players can drive and take control of the structure in play. Adventures in monkey come in two different forms: Scripted Adventures and Adventure Seeds. Scripted Adventures fall somewhere between traditional roleplaying game write ups, were every last detail and possible action is written down, and more modern approaches that rely heavily on improvisational techniques. The reason for this is because the Players are firmly the stars of the show and are playing lesser gods, whose only weaknesses are their own failings. So even the most cleaver plot or tough monster can quickly be overcome or even circumnavigated by the players. That’s where the fun lies for them and the Narrator’s job is to provide a ‘toybox’ environment full of thrilling locations, exciting potential Actions and a cast of engaging Major Story Immortals, their Supporting Characters and the mass of unnamed Extras for the Player Immortal to play with. 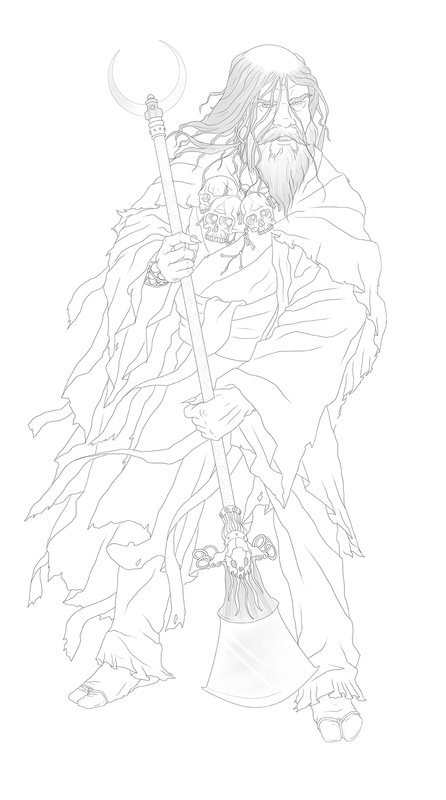 Not only will the 2nd Incarnation have at least one example scripted adventure (the ever reliable “Bag of Wind” which featured in the first edition) with a second being added if the stretch goal is reached (see Day 9 “If you see Buddha on the Road”), but it will also provide a clear template for narrators to use to quickly generate their own Scripted Adventures. Adventure Seeds have long been a part of most roleplaying supplements were an idea is worth expanding into an outline for an adventure, but page count is limited to prohibit a fuller write up. In Monkey the 2nd Incarnation it’s my intention to have a section of Adventure Seeds that can explosively act as the starting point for a full sessions play in a format that gives enough inspiration to Narrators and players. 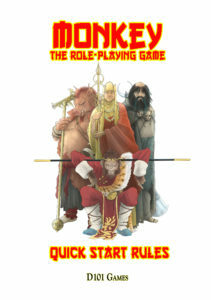 While Monkey is very much like a traditional roleplaying game, in that it has a referee called a Narrator who is the adjudicates rules disputes, vetoes implausible player actions and reacts to player actions by describing how the environment and non-player characters change as a result, it is also does this in full cooperation with the players whose characters are firmly the centre of the story that emerges through play. Part of this ‘player-centric’ approach is that players can directly influence the structure of a scenario in three ways. Stealing the Scene: Scenes are the building blocks of an adventure in the same way as in a film or play. Normally the Narrator gets to describe the location and circumstances that the players find themselves in. Under special circumstances the Players can ‘Steal the Scene’ from the Narrator. For example the Narrator is getting ready to describe the Palace of the Many Plumed Tyrant Demon, but the players collectively and unanimously decide that it would be better for them to have the next scene in the Western Heaven asking their Patron Deity, the Wise Planet Venus advisor to the Jade Emperor himself, how to defeat the Many Plumed Tyrant Demon, since they have no idea and have been defeated by it in previous scenes. Hence the scene shifts temporarily to the Western Heaven. Being under the Spotlight: At the beginning of the scene one of the Player Immortals has the ‘spotlight’ and are able to put their character first in describing what they are doing. This happens naturally in the book, where some scenes focus on Monkey but others start out with what Pigsy, Tripitaka or Sandy are up to. It’s something I wanted in the new version of the game because it helps quieter players, who are perhaps swamped in all the banter produced as more outwardly players get excited. 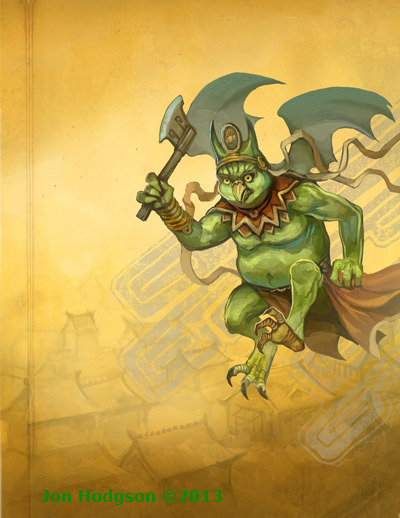 Playing the Immortals Weakness: The player can gain an extra card to put to one side to play in a later action by briefly describing how their Immortal’s weakness gets them and the rest of the group into trouble. For example the light-fingered Fox Spirit Red Fur, whose weakness is Theft, and companions are trying to sneak through a large crowd of people avoiding the attentions of the local City Guards. Red Fur’s player mischievously reckons its worth playing Red Furs Weakness , and alerting the City Guards to the group’s presence in the crowd, to get an extra card for later on. So Red Fur cannot help herself and tries to unsuccessfully to pick the purse of a very fat and very loud passing merchant. Such extra cards, which the player may have no limit of, must be drawn without looking at and stored face down until played in an Action. A player who has the Spotlight may also Steal the Scene and Play a Weakness. For example Pigsy’s player, who has the spotlight Steals the Scene by deciding the Pilgrims should abandon the dusty road to India and the Demons that await them, and take shelter in an Inn and partake of its food and wine to excess instead (playing Pigsy’s Weakness). Instead of encountering the Demons on the road, the pilgrims encounter them as they are hung over and debauched as they burst weapons drawn through the Inn’s main door. Pigsy’s player smiles slyly to himself and draws an extra card face down. Day 20 of 23 Days of Monkey, 3 days until the Kickstarter opens on Sunday 8th January. The Jade Emperor, co-ruler of the Western Heaven. 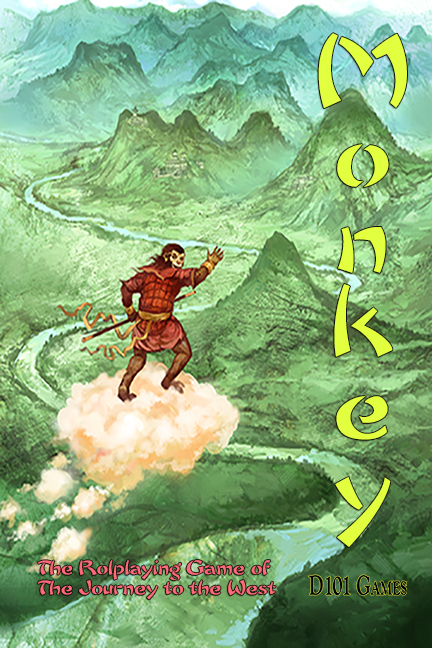 Today I’m going to talk about the most ambitious game of Monkey I’ve ever written – The Mega Monkey. I’m planning to run the whole thing at 7 Hills convention in April, after play-testing it with my home group. I’ll also run it again at UK Games Expo, but I’ve yet to organise this. If the Kickstarter campaign is successful, The Mega Monkey will be one of the Stretch Goals available to backers. You can either run it as an event, with two to three tables, as I plan to do at 7 Hills or run it with a single group (as I plan to run it at home during my playtesting) or simply break it down into pieces and use the events and plots as Adventure seeds and expand them into full sessions of play. The Mega Monkey in its full form is made up of three gaming tables. Each table is one of the locations from that features prominently in the Journey to the West. First off is the Western Heaven, ruled by the Jade Emperor and the Queen Mother of the Western Heaven, who represent the forces of Yang (masculine/active) and Yin (feminine/passive) respectively. Their palaces are at the top of the Heaven, a city made of Jade and other precious gems and metals which floats on clouds above the holy mountain of Kunlun. Below them are the Ministries of Heaven that run various affairs, such as the Ministry of Thunder led by the Bat Winged Lei-Gong Lord of Thunder whose job is to bring to justice criminals that the mortal authorities cannot. 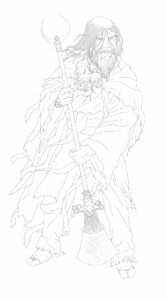 The Western Heaven is also home to many deities such as Lao Tzu the Grandfather of Taoism, the Planet Venus and General Le commander of the heavenly hosts and his son the demon Hunter Prince Natha. 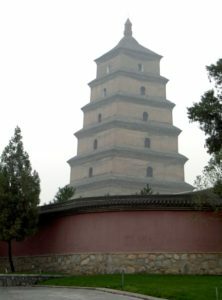 As well as the Ministries and the palaces of the various Immortals are places like Lao Tzu’s Forge and the Peach Gardens of the Queen Mother. The player immortals who start on this table are Mandarins, Guards and Magistrates of Celestial origin who were born to serve one of the Great Immortals directly or one of the Ministries. The second table linked to its heavenly counterpart is the capital city of the Tang Empire Chang’an. Here the Tang Emperor rules the teaming masses of urban Chinese. The city is made up of a grid of city streets and divided into districts, some residential, commercial (which houses the city’s great market), some dedicated to entertainment (with theaters and brothels) and of course the temple district that houses the wooden temples of Buddhism and Taoism. The Player Immortals are made up of Earthly Immortals who report to the local City God and are responsible for Earthly affairs, such as the smooth flow of the local rivers or the fertility of the local rice fields. The finally the last table is the Ten Courts of Hell, were King Yama oversees the judgement and punishment of sinful mortals. This is a dark, dangerous place, with its own order and rules were the Player Immortals are Demon Guards and Judges responsible for keeping the sinners within its boundaries until their allotted time is up and it is time for them to drink the waters of forgetfulness and be return to earth in their next mortal incarnation. Each table has its own collection of locations, events and characters, which are involved in various sub plots. 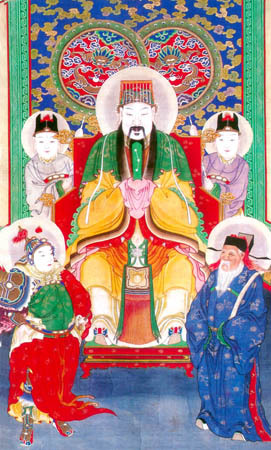 The player immortals may start on the table of their origin, with all the responsibilities and relationships that that implies, for example all Celestial Immortals of the Western Heaven are subjects of the Jade Emperor by default, but at various locations and during certain events they can travel to the other locations, with the permission of the Narrators of the two tables involved. For example, the Palace of the Western Queen of Heaven has a magical Cosmic Pillar were not only communications between heaven and earth are possible but also transportation. While very sandbox in nature, the wanderings of the Player Immortals and their interactions with the various plot lines, build up to a story of a demonic threat to the order of Heaven and Earth. Of course this being Monkey this is all very light hearted with moments of high comedy and intense action. Day 19 of 23 Days of Monkey, Kickstarter opens on January 8th in four days time. Today we look at the third of the four pilgrims, the ever downbeat Sandy. Sandy was once a Marshall of the Armies of Western Heaven until he broke the Jade Emperor’s Jade bowl at one of his parties. Cast out of heaven he became a water demon, preying on passing travelers. He fought Pigsy and Monkey, as a Water Monster, until he realised they were travelling with Tripitaka, who he knew was his source of redemption. Throwing himself at the monk’s feet he dedicated himself to the Buddhist way and protecting him on his Journey to the West, to bring back the lost scrolls of Buddhism from India. If the four pilgrims represent humankind’s common failings, Monkey is recklessness, Pigsy lust and gluttony, Tripitaka fear, then Sandy is the tendency to see everything in a bad light. This leads to some black comic moments in the book as Sandy mournfully reflects on all that could go wrong. Skull Necklace of Buddhist Pilgrims. This necklace made of the skulls of buddhists, to virtueous to sink to the bottom of the river is used by Sandy to form a raft to take people across. Here’s the scene where Monkey meets Sandy for the first time in the 80s Japanese TV Series, as the Pilgrims are trying to get Tripitaka safely across the river that Sandy is dwelling in. Day 17 of 23 Days of Monkey, Kickstarter opens in 6 days on 8th September 2017.